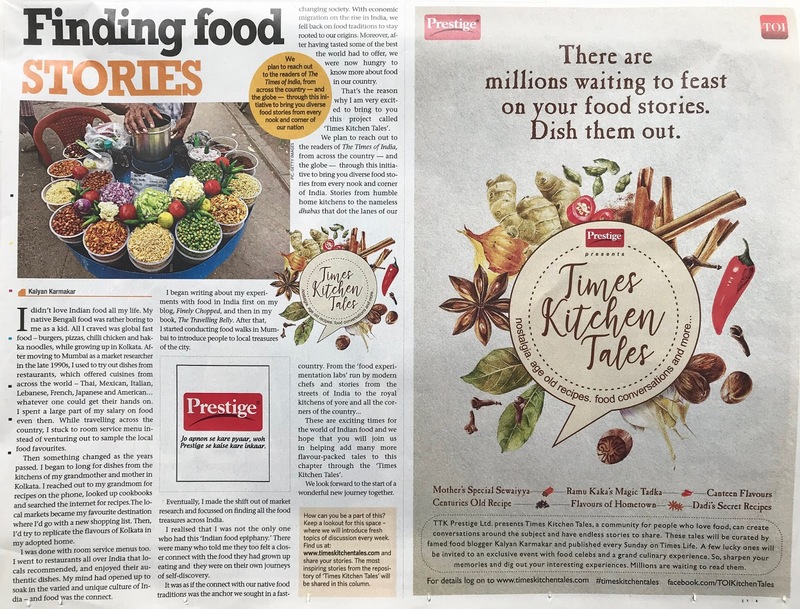 What is the newly launched Times Kitchen Tales all about? 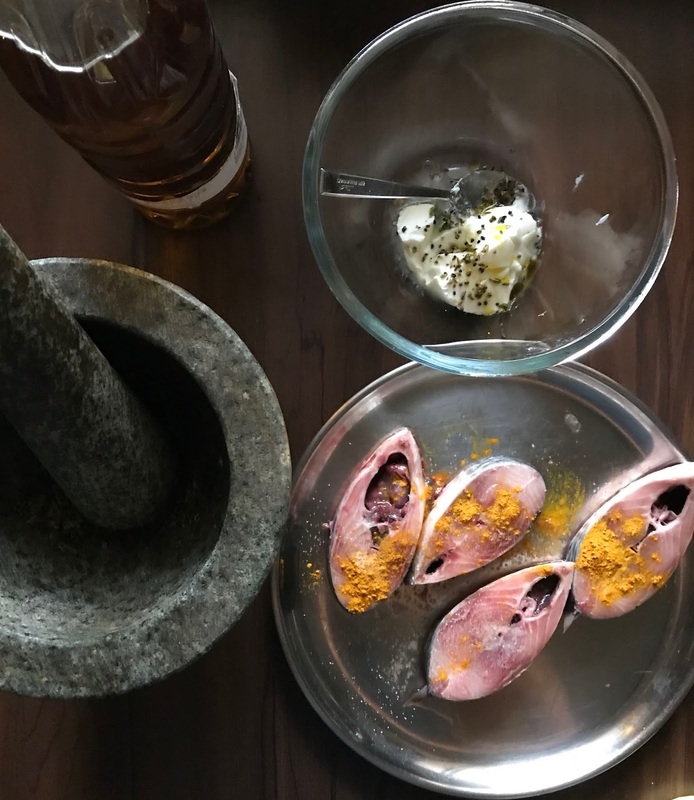 How about a recipe for panch phoron kancha lonka diye ilish maachh to explain it? "It is always good to fry some of the fish one has bought from the market and eat it fresh with rice when one comes back home," said my mother to me, when she had come to visit us in Mumbai from Kolkata sometime back, and when we had gone to the fish market at Khar in together one Sunday. I remembered her words when I returned from the Khar fish market today with two bags full of fish. Doing the Bombay Bangali Sunday thing as I said later on Facebook. 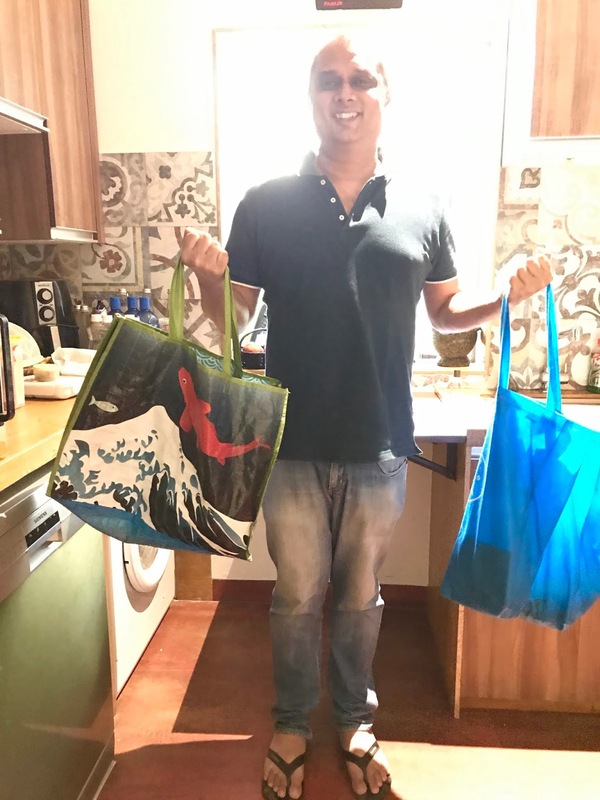 In one bag were the Mumbai seafood superstars... bangda, rawas and surmai. In the other were kaatla, parshe and ilish, varieties of freshwater fish that sing to my Bengali heart. Doing the 'Bombay Bangali biceps routine'. In our kitchen. After the fish market. There was the chicken curry that Banu had made last night for our lunch today in the fridge but I decided to bring some of the fish into the maidan instead. The decision on which fish to choose was a no-brainer. Ilish it was of course. Hilsa. Shaad. Thankfully I was. 'Thankfully,' because even more than me, my wife, a Parsi loves ilish. So did my later father in law. He knew it as 'bhing', the Gujarati word for the bonier Gujarati cousin of the ilish. We Bengalis do not own the copyright to ilish as I learnt over time. I am not just referring to our brethren from Assam, Odisha and Bihar in eastern India here and who dote on ilish too. The Sindhis love it as well for example. They call it pala. The God of the Sindhis, Lord Jhulelal, is depicted as sitting on a pala fish. There was a Sindhi lady at the fish market today buying fish when I was doing so. She was intrigued to know that we Bengalis like pala or ilish and was impressed to know that I was aware of the role pala played in the life of the Sindhis. She told me that pala is made by the her family on auspicious occasions in a thick onion and tomato based paste with a sprinkling of garam masala and curd. The dish is then eaten with jowar (millets) roti. Our fisher ladies, Poonam and Sangeeta and their mother Heera Bai, listened looking stunned. They are Maharashtrian and the Maharashtrians do not mix dairy and seafood or fish from what I gather. Nor did mamma, K's late grandmother. A Parsi. I told the Sindhi lady that we Bengalis (from India) do steam ilish in a mustard and curd based sauce. We avoid putting onions in it, though our cousins from the east of Bengal, Bangladesh, do so. My ancestors are from what is Bangladesh today. However, my grandmother tells me that the idea of using heavy spices, let alone deep frying the ilish or adding onion to it was unheard of when she was growing up in pre-partition Dhaka in the early 1900s. The fish that they got was so fresh back then. "You do things to fish to mask its lack of freshness," said didu (my granny) sounding every bit like Marco Pierre White as she did so. 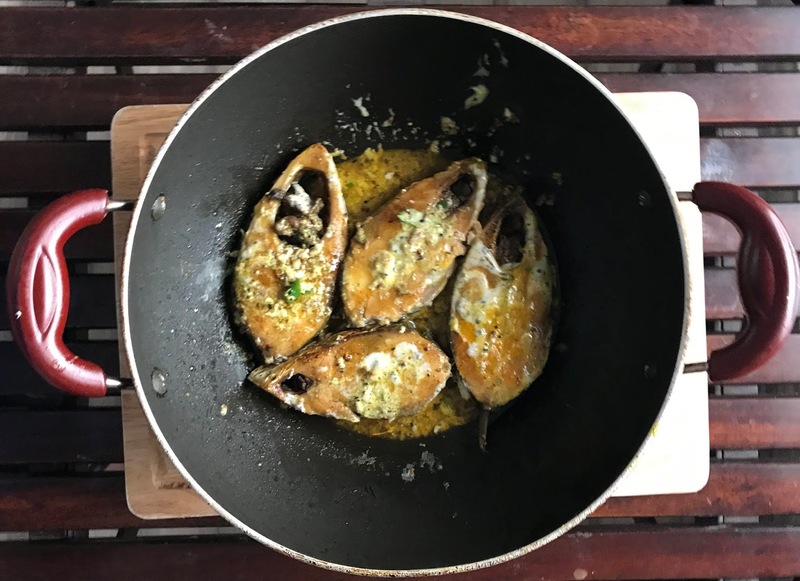 And how did I cook the ilish today? I did very little to it too. I did not need to. "It is so fresh," exclaimed the Sindhi lady when Poonam sliced the ilish that I bought today and she was right. So here's what I did. I tried a method that was new to me and that came to me just as I entered the kitchen. I took a spoonful of panch phoron (Bengali 5 spices) and 1/2 a teaspoon of whole mustard seeds and a green chilli. I put this in my mortar and pestle and pounded. Baata as we say in Bengali. Thecha in Marathi, Pesto in Italian. I had bought mortar and pestle in Chiang Mai years back. Used to make Italian pestos and Thai curry mixes in it once upon a time. This was the first time that I had made something Indian in it. My late thakuma (paternal grandmother), who used to still make her masalas on a sheel nora (the Bengali mortar and pestle) when I first met her as a tiny tot visiting from the UK, would have smiled on seeing me. My didima (maternal grandmother) used mixer grinders ever since I knew her. She spent most of her adult life in Delhi and was more exposed to the modern world. I added half a teaspoon of mustard oil (the Bengali oil of choice) to the Bengali panch phoron pesto and blended it with 50 g of curd. I then smeared 5 slices of ilish (sliced round with gaanda and peti, stomach and back, both together) with turmeric and salt. I first heated two tablespoons of mustard oil in a wok. I slid in the fish pieces into the wok (kodai) next. Shallow fried it on one side for a minute and then turned the pieces around and shallow fried them for another minute and then turned off the gas. I poured in the yogurt and paach phoron sauce next and then gently layered it on both sides of the fish and was done then done with my cooking. That's how simple it was. I used the word 'gently' here as the fish breaks if not handled gently. 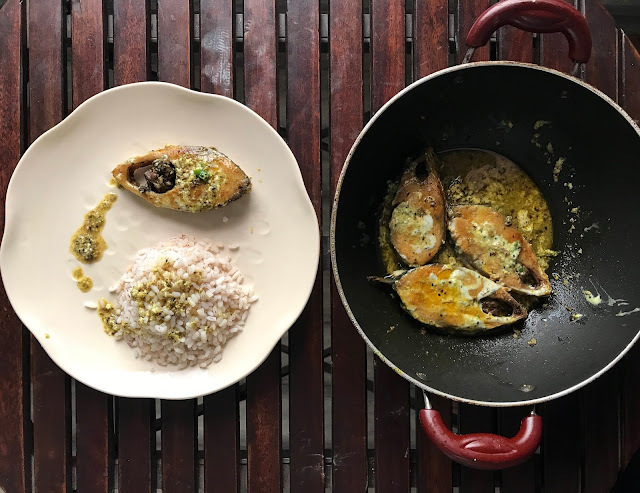 I had the panch phoron ilish with the red rice which the Malayalis and Mangaloreans and Goans love and I have taken to now because of its low Glycemic Index. I loved the dish that came out of our kitchen. As did the Bawi (Parsi) at home. And a friend staying with us who was born in Dhaka and had grown up there too before she moved to India. 3rd December 2018 update: In retrospect I feel that one could have also dry roasted the panch phoron pesto first and then added it to the curd with mustard oil and blended it. The flavours of the spice would be more prominent then. On the other hand, the fish was the hero in this case. Gosh. Did you see the number of cultural references and influences and personal memories that were there in the story of this one dish of mine? Well, you will see a lot of that in something that we have launched today and whose news I am thrilled to share with you. I am talking of the Times Kitchen Tales. It is an initiative to celebrate the world of Indian food from the Times of India. I have the privilege of being the curator of this and am most thrilled about the project. The first article of mine in the series came out today and you can catch that in the Times Life section of the Sunday Times. We will bring you fresh stories every week and then look to your sharing tales from your kitchen too as a part of this movement. I look forward to hearing from you just as the whole world is waiting to hear tales from the magnificent world of Indian food. So please start writing your stories here and do try this recipe too. I will take a quick Sunday nap and then sit to read what you have written. All of the spices in panch phoron are seeds. Typically, panch phoron consists of fenugreek seed, nigella seed, cumin seed, black mustard seed and fennel seed in equal parts. Some cooks prefer to use a smaller proportion of fenugreek seeds, because of their mildly bitter taste. I buy a ready-made mix from Vijay Stores in Bandra's Pali Market in Mumbai.